If you’re reading this it’s likely you’re on Facebook (it's also highly likely your prospects and customers are on there as well). After all, there are over 2.3 billion active users on Facebook worldwide. Since its inception in 2004, this social network has grown by leaps and bounds. It’s free to become a member, of course. So how does Facebook make its billions? Well, Facebook is so much more than a place for people to connect online. In fact, you should really think of the website as a marketing platform, one of the most powerful marketing platforms in the history of business in fact. It allows companies large and small to market to their prospects and customers in a highly targeted and engaging way. It’s the ideal channel to generate leads and boost sales of products and services in just about any niche or industry. With so many people on Facebook, your audience is certainly there no matter what your market or niche is. Actually, if you’re in business today, especially online, you can’t avoid marketing on Facebook in some way. Advertising on Facebook is relatively easy compared to other platforms and can be highly targeted. But there are some tricks to keep in mind to make sure you maximize your return on investment and can actually connect with your specific ideal customer among all the millions on the network at any given time. In many ways, Facebook is a living animal, always changing, always moving. You’ve seen it in your own feed. It seems like every hour there is new content ready to be consumed. The best part is—all this effort to nurture and grow your audience and generate leads is free. But important to note is that you must provide plenty of useful information—you can’t hammer people with sales-y copy in their news feed. That turns them off. You may want to consider using a social media scheduling tool to help automate you Facebook posting activities and if you're Facebook presence grows large enough where you are having to moderate and respond to many comments you should consider hiring or outsourcing somebody to handle your social media marketing. One of the metrics that too many companies on Facebook strive for is more “likes” and “followers.” Yes, those are important numbers. But what you should really be focusing on is reaching your best customers. By that, I mean those more likely to buy and even buy repeatedly. Providing free content is an important part of any Facebook marketing strategy. But you should also use paid advertising because it allows to quickly reach your best customers. The great thing is that Facebook has reaching your target audience down to a science. Using their “back office” tools you can drill down to people who are likely to be interested in what you have to offer and who will want to find out more about your products and your company. Facebook also offers advanced options where you can upload your list of existing prospects and customers and Facebook will create a "lookalike" audience of people who are most likely to do business with you. After you've got the targeting done it's up to you to create engaging copy and compelling offers that make them take action. Your Facebook marketing strategy definitely should not be set it and forget it. This is social media. You have to engage with your audience. That means replying to questions. Addressing comments. If there is an issue or concern—you make a new post to clear the air. Being active on Facebook and having an engaged audience signals to Facebook that people are interested in you and your business and will help you do better with the free content you post as well as with the paid ads you may be running. 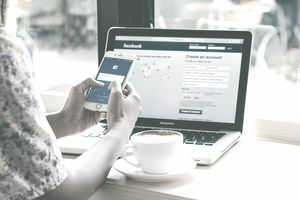 Facebook is all about maximing the time their users spend on their site, and if you're more active, are building a community of engaged people you'll reach more people, drive more traffic, and get more leads and sales. You won’t see results from your Facebook marketing strategy overnight. It’s a gradual process that you have to work at. If you want faster results you should serisouly consider exploring all of the paid advertising options Facebook offers. You'll find it's very easy to reach a very targeted audience. But put in the effort and you’ll see great results with your Facebook business page on your bottom line. You may find that Facebook is your most valuable and profitable marketing channel in your business.